A Palestinian man from the West Bank city of Tulkarem was shot, then taken into custody by Israeli police in Tel Aviv Wednesday after stabbing several people on a bus. Israeli authorities say they are considering this a terror attack. The 23-year old man apparently entered Israel illegally, despite the massive Israeli Annexation Wall that virtually surrounds Tulkarem and nearby towns. He has not yet been identified. 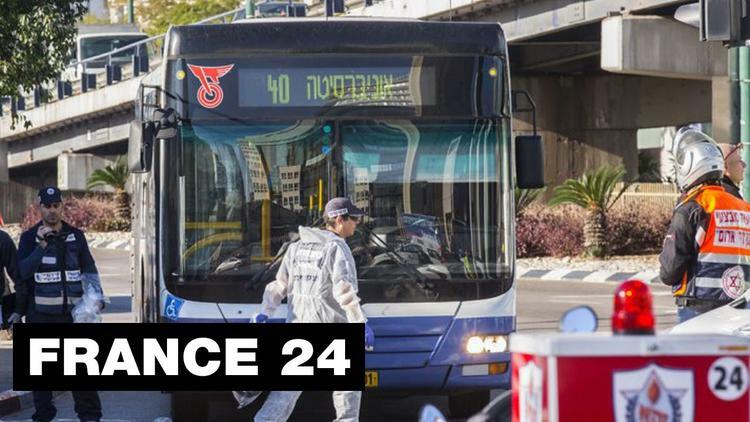 The attack took place on the #40 bus on Menachem Begin Road in Tel Aviv. The assailant fled from the bus on foot but was shot in the leg by police, who then arrested him and brought him to prison. Nine Israelis were wounded were wounded – 3 moderately wounded, and 6 lightly wounded, according to Israeli media. The driver was one of those who was stabbed in the attack. Israeli media sources are also reporting that five additional passengers were suffering from shock. A representative of Hamas issued a statement in support of the attack in Tel Aviv, although the motive of the attacker remains unclear. In the past four months, 7 Israelis have been killed by Palestinians, six of those killed were civilians and one was a soldier, in what Israel has called an ‘uptick’ in violence against Israelis. During the same time period, 32 Palestinians have been killed by Israelis, one of whom was known to be an armed resistance fighter. The rest were civilians, including a Minister in the Palestinian Authority and a 13-year old child. Three Palestinians were killed in the past week alone – one was killed while attending the funeral of the other, who had been killed during a house raid in the Negev. The third was killed near Bethlehem. None of them were armed. Also, in the past 10 days, five Palestinians including four babies have died of the cold in Gaza, where tens of thousands remain homeless following Israel’s assault last summer that left over 2100 people dead, including 500 children.